Allowing enmeshing of design and development by single agency, in this case private industry who were to be responsible for erecting production facilities locally for their systems, assemblies, and components, in addition to providing any requisite engineering support for integration. Foreign assistance, if required, was envisaged at systems and sub systems level through industry import that would also help further develop indigenous capabilities through technology transfer. MoD surveyed private and public industry to zero in on potential contractors. Based on the GSQR, the Expression of Intent (EOI) worked out in 2009 laid down that the FICV will be operated by three crew members, and carry seven additional soldiers with combat loads; it must provide protection from bullets fired by 14.5mm calibre weapons; it must be amphibious, i.e. capable of floating in water; it must be air-transportable, which would imply a maximum weight of 18-20 tons; and it must have a grenade launcher, co-axial machine gun, and be capable of firing anti-tank missiles (fire and forget type). MoD is to fund 80% of the cost of developing the FICV; the selected contractor is to pay 20%. It has been mandated that the FICV must have an indigenous content of at least 50%. The EoI was sent to Mahindra Defence Systems, Tata's, L&T and OFB in 2009, each of whom had submitted their technical and commercial bids, while the Army continued using the Russian BMP-1 and BMP-2 vehicles that were slotted for mid-life upgrades. However, in another decade, the Indian Army will need better and advanced vehicles to replace the upgraded BMP-2. Hence, the need to put the FICV project on fast track. The Indian Army is looking at the production of 3,000 FICVs to replace the upgraded BMPs at a cost of $10 billion. The project had got bogged down because Russia offered the BMP-3 but was not accepted since indigenous firms had invested heavily in the project. Finally, two developers are to be shortlisted who would be required to produce five prototypes in the laid down time frame for user trials. Attempt by OFB to partner DRDO as a design partner was not accepted under the plea that eventually DRDO will be the agency responsible for technology evaluation and approval and hence could not partner OFB. Given the lack of design perspective actually implies that OFB will have to tie up with one of the other vendors for design and development if it wants to compete for the project but DRDO believes it will be approached for key technologies and the OFB which manufactures the BMP-II at Medak for production assistance. 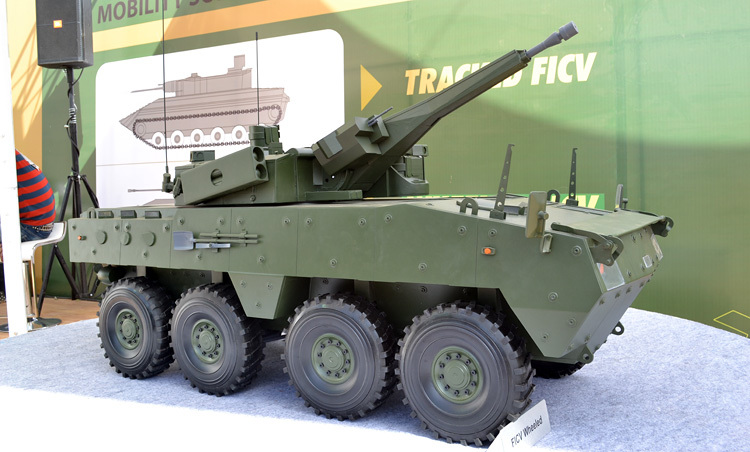 As per earlier reports, this was not to be a winner-take-all competition since MoD planned to retain two production lines, the winner given 65-70% of the order; the runner-up to build 30-35% of the Army's requirement of FICVs, provided the latter company agreed to build the winning design at the same cost as the winner. With two assembly lines operating, India's private defence players expected that the FICV contract will create an eco-system of suppliers extending far beyond the winner of the contract. However, this appears to have undergone a change with the present government since it came to power in 2014. Now reportedly only one developer who tops the prototype trials will be selected to produce the FICV. This makes much more sense vis-Ã-vis two production lines by two separate developers, considering the issue of spares, supplies, maintenance, repairs etc. In 2014, Project FICV was planned to be restarted afresh to include indigenous firms like Bharat Forge, Punj Lloyd, Force Motors and Ashok Leyland. These additional indigenous firms were included through a fresh "acceptance of necessity", as approved by the MoD. The foreign firms that were likely to go in for joint ventures (JVs) with Indian partners reportedly include Rosoboronexport (Russia), General Dynamics (USA), Rafael (Israel), Nexter and Thales (France), Krauss-MaffeiWegmann (Germany) and Doosan Group of Republic of Korea. After approval of the 'acceptance of necessity' and inclusion of more domestic companies, detailed reports were to be submitted to MoD by end 2014. The two development partners were then be shortlisted to build the prototypes. However, all this appears to have got log-jammed due to remains stuck in bureaucratic bottlenecks and wrangling, corporate rivalry and controversies. It appears that OFB plus two indigenous part companies will eventually be selected to design and build the prototypes. Hopefully, Defence Minister Nirmala Sitharaman pushing meetings of the Defence Acquisition Council to fortnightly basis will give the much delayed FICV project due impetus. However, considering that the vendor / vendors selection may take another 3-4 years after the prototypes are trial evaluated, induction of the FICV will likely commence only around 2027-28, provided there are no more hurdles.